Product categories of Seed Cleaning & Processing Machine, we are specialized manufacturers from China, Seed Cleaning Machine, Seed Processing Machine suppliers/factory, wholesale high-quality products of Seed Cleaning Processing Machine R & D and manufacturing, we have the perfect after-sales service and technical support. Look forward to your cooperation! 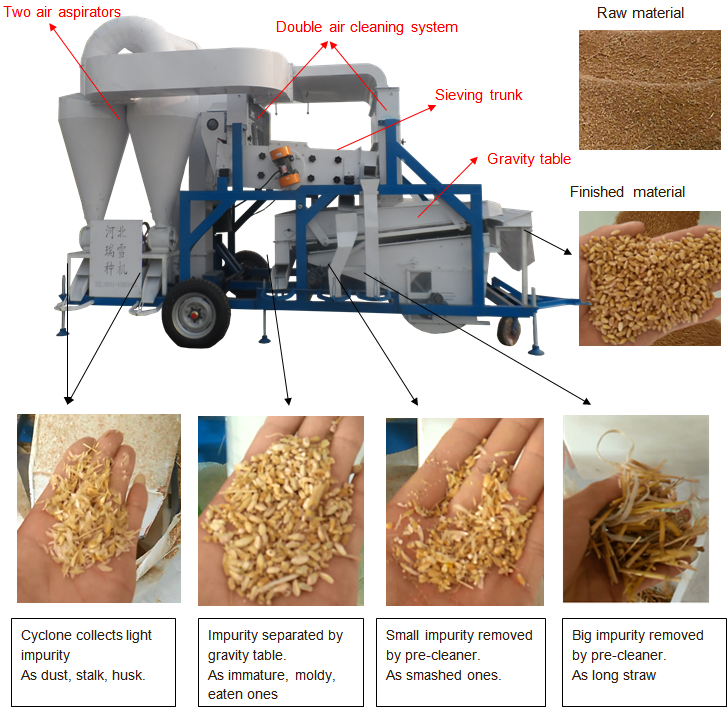 5XZS series Seed Cleaning & Processing Machine is the combined grain seed cleaning equipment. It installed wheat huller, air cleaning screen, vibration pre cleaning sieve, gravity table, vibration sieve cleaning and grading trunk. It maximizes one machine cleaning function, minimize the labor, easing of removability. This is our featured product. Since it comes to the market, it attracts customers' attention. Removing coated wheat husk in the wheat huller. Remove dust, light impurity by double air screen cleaners. Cyclone collects dust, stalk, and husk. Remove big, small impurity in the pre cleaner. Remove immature, eaten, sicken, moldy ones from healthy seeds on the gravity table. Remove big, small impurity and grade seeds in the vibration sifter. Firstly wheat is fed from wheat huller hopper. After hulling, wheat is transferred by Bucket Elevator to precleaning sieving trunk for removing big and small impurity. There are two air screens at this sieving trunk two ends and connect air pipes. 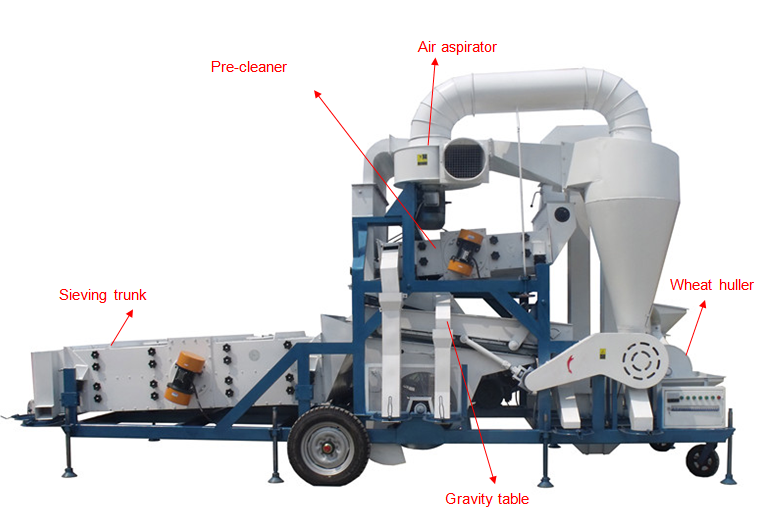 The dust cleaning system will remove the light impurity from grain twice before grain flow to gravity table. Then grain seed enter to the gravity table for removing the bad seeds. After Gravity Separator density separating, the seeds flow to main sieving trunk. In this main sieve trunk, the oversize impurity, undersize impurity will be removed. At same time, the sieve trunk can grade wheat to different size ranks. Grain cleaning & Processing Machine has many adjusting handles. With these adjusting handles, operators can easily find the suitable air volume, vibration amplitude. Machine is user friendly and simple maintain. We have 10 tons per hour and 20 tons per hour model. The wheat huller is optional. If clients do not clean wheat, they can order the model. The main sieve trunk we have two models: normal 4 sieve layer one and two sieving deck one. If customer only uses the machine for cleaning aim, no need to grade seeds by size, client can choose the two sieve decks type.